Does Your People Process Include a Stay Interview? We ask people questions when they leave, it is called an exit interview. We ask people questions when they get hired, it is called onboarding. Do you ask people questions each year designed to explore how they feel about their work and to ensure proactive action is happening to make their job more desirable? If you don’t, you should. This is called a stay interview. 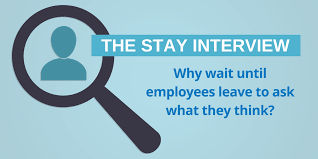 Stay interviews can be a crucial part of your people process, because it focuses on your best people and it allows leaders from other parts of the organization to get to know them and help identify potential changes that would make them more engaged and your business more successful. Does that sound like a win/win? Recently Ken Savage, who has accountability for people at Cascade Die Casting Group, shared the questions he implemented as part of their stay interview process. It is targeted at their most valuable people, and it is a way for him to go out into the business to listen. What about your job do you like the most? What about your job frustrates you the most? Do you feel like you get recognition for your performance? Where are you being under-utilized? What about your job would you change? Could anything tempt you to leave this organization? The caveat Ken shared is the questions are not exact, but a synthesis of a conversation that would include natural follow-up questions based on responses. If you would like to learn more about how Cascade Die Casting Group uses the stay interview, let me know and I will connect you with Ken. He has graciously agreed to talk individually with people wanting to know more. A great process design quote I heard to support the 80/20 rule is to design your processes for your best people. That will be enough for them to get it done well, and if they don’t get it they are probably in the wrong seat.